McDonnell suddenly resigned from his position of Locomotive Superintendent with the North Eastern Railway (NER) in September 1884. Although only seven of the ordered thirty six "38" Class 4-4-0 locomotives had been delivered, it was clear that they lacked power when hauling the heavier trains that they were designed for. In fact, the existing Fletcher "901" Class 2-4-0s proved more capable with these duties. It would be twelve months before McDonnell's successor, T.W.Worsdell would be appointed, and the NER urgently needed a capable express locomotive. To this end, the NER's General Manager, Henry Tennant, chaired a special committee to design an express locomotive. The design process was very quick: tenders for materials were issued in December 1884, and the first locomotive entered service in May 1885. Officially known as Class "1463" (LNER E5), the new locomotives quickly acquired the nickname of 'Tennants' after the design committee's chairman. The new E5 locomotives were direct descendents of Fletcher's "901"s. The cab design was changed, and a completely new tender design was used. A total of twenty E5s were built in 1885, with Darlington and Gateshead building ten each. The only rebuilding involved the fitting of Worsdell-pattern boilers between 1892 and 1896. It will be noted that the initial boilers had very short lives, even compared to boilers on contemporary NER locomotives. This was because of the particularly high mileages worked by the E5s, and the boiler's iron construction. The new boilers represented a reduction in tubes from 221 to 205, but an increase in working pressure from 140psi to 160psi. These rebuilds did not have a significant effect on the external appearance of the E5s. In about 1899, No. 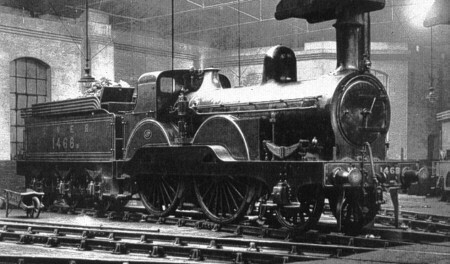 1467 was fitted with Younghusband's patent valve gear. Younghusband was in charge of a section of the NER's drawing office, and this valve gear was tested on a number of NER locomotives. 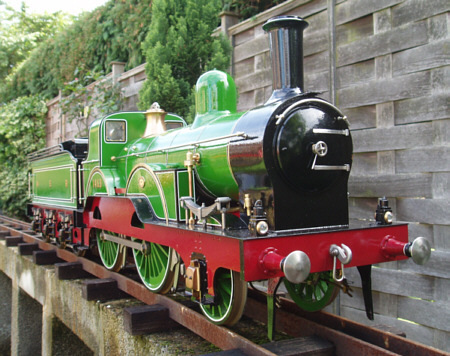 The design was based on Gooch's valve gear, but achieved a maximum steam port opening in a very short period of time. The valve gear had the disadvantage that it was very heavy, and it was not fitted to any further E5s. Stephenson valve gear was eventually re-fitted to No. 1467, although the exact date of conversion is unknown. It may have been as late as 1918 when No. 1467 received new cylinders. Ramsbottom safety valves were fitted. These were initially uncased on the original boilers, but they were given brass trumpet-shaped covers when the Worsdell boilers were fitted. Designed for heavy express passenger work, the E5s took up these duties very quickly with few problems. During the summer of 1885, No. 1467 was trialed with Fletcher "901" Class No. 156, and McDonnell "38" Class No. 126, between Penrith, Darlington, and Saltburn. The results of these trials are not recorded, but the E5 must have performed well. Their adoption was quick, and they were quickly clocking up mileages of 40,000 miles per year. This was in excess of any other contemporary NER locomotive type, and would not be exceeded until the introduction of the D20 4-4-0s in 1899. The introduction of the D22 4-4-0 (NER Class F and F1) locomotives in 1886, concentrated the 'Tennants' to the Newcastle-York section of the NER mainline. Further 4-4-0s displaced the E5s from the main line to secondary expresses, such as the Scarborough-York-Leeds route. The E5s continued to clock high annual mileages on these secondary services. All twenty E5s were still allocated to secondary express duties, when they entered LNER ownership (1923). As well as the Scarborough route, typical services also included the Darlington to Penrith, and Darlington to Tebay services. The final allocation during the 1920s was: Darlington (7), Kirkby Stephen (4), York (3), Sunderland (3), Durham (2), and West Hartlepool (1). Withdrawals started in 1926, and were completed with the withdrawal of No. 1474 from York in February 1929. No. 1463 is the only E5 that has survived into preservation. 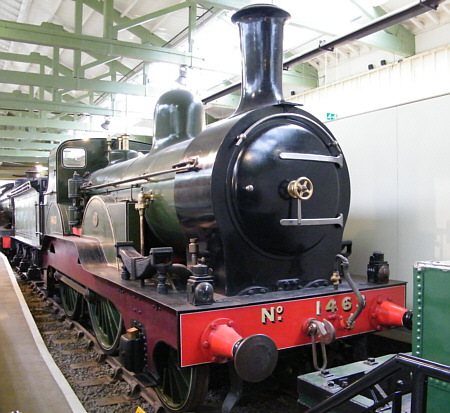 It is owned by the National Collection, but is currently on loan to the Darlington 'Head of Steam' Museum. I am not aware of any ready to run or kit models of the E5 locomotives. The adjacent photograph is of Eric Horner's 5in gauge E5. The model was based on multiple visits to Darlington, and required privately-produced castings using Eric's own patterns. Thank you to Malcolm Peirson for the photograph of the E5 No. 1468 as built with a round-topped firebox. Thank you to Robert Langham for the photograph of No. 1463 at Shildon 'Locomotion'. Thank you to Eric Horner for the photograph of his 5in gauge model of a Tennant E5.